The idea for the book The Culinary Cyclist came about December of last year, so for the last six months I have had bikes and food on the brain. Well, I always have bikes and food on the brain, but this time as I wrote chapters about coffee, picnics and planning a dinner party, it was book related. And now, after six months, the book is completely written, the illustrations are drawn and now it’s finally time for you to support the project! We’re raising the printing funds for the book on Kickstarter, which means that if you give $12, not only are you pre-ordering your very own copy of The Culinary Cyclist – which is packed full of recipes and guides to good living – you are also helping to support independent media and ensure that we can print as many copies of this book as possible! And for those that want to go just a little above and beyond, if you support the project at a higher level there are some fancy rewards involved – like one of Johanna Kindvall‘s prints and a Laura Cooke Ceramics mug made specially for us with an illustration from the book. Get a copy of The Culinary Cyclist here. Special thanks to my good friend Jenny – founder of Pongo Media Productions – who made the video. Thanks for all of the support on Kickstarter. 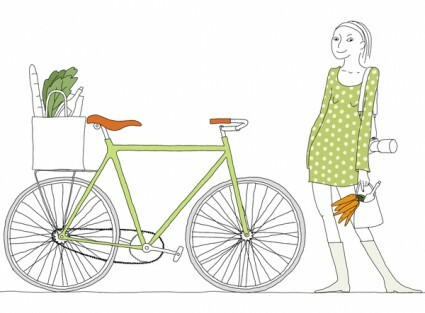 Fully funded you can now pre-order a copy of The Culinary Cyclist right here on Foodie Underground.